So 2 of my nieces will be going to primary 1 next year, so I thought of getting them these watches as a birthday present. Plus it will be very handy, since there will be a lot of other school children there so contacting them would be a breeze. Since it was on sale that stated it comes with GPS, I thought of getting them this instead of the Q50 because I too was curious how these watches works as compared to the Q50. So out of the box you got your usual charging cable, watch and some manual. Never the less, here’s the front and back picture of it. Unlike the Q50 watch, the back case doesn’t comes with screw. So you could easily pry it open with your fingers, and gain access to the sim slot area. You’ll first be greeted with the home screen, that shows the signal bar, data connection (up and down arrows), battery life, Time, reward points, date and day. I noticed since last year, whenever I purchased these GPS watches I don’t really need to set up the APN. Some how they were automatically configured, plus the seller has set the IP pointing to the Asia server. Despite the seller states that it comes with GPS, but apparently it only comes with LBS which pretty much got me disappointed. Never the less can’t complain much as the price I paid for it was quite cheap but the other feature works well. If you require to set up your watch, head over to my Q50 review page as the commands are pretty much similar. Since this is touch screen, to go to other menus just swipe to the left or right you will be able to see the following menus. The green phone button which is located at the bottom of the screen functions as a back button and home screen. Should you enter a menu selection, to go back press that green button it brings you out to the menu selection screen. If you press it another time, it will bring you back to the main screen. Unlike the Q50, you can only make calls those who are inside your phone book. Not for this case, as you can actually dial out the number that are not included inside your phone book. If you press the contact button situated at the bottom left of the screen it will bring you into the phone book section. Phone book is pretty much similar to the Q50, where you can scroll up and down to select the person whom your child wishes to call. Initially I thought they will not black list the calls from unwanted calls, that was before I added a phone number inside the watch. So those number who are not inside this phone book will not be able to call your child. This quick learning menu will bring your child to a game where, it gives you an option to see if the answer is correct or incorrect. There’s a few games you can choose from, that are from simple additions and subtractions to multiplication and division. There’s a 3 seconds timer to enter in your correct selection. In this menu it will show you 2 QR Code, one is for downloading the app while the other is to show the ID of the watch. Now this is a good move because, I had this one case where my friend’s son actually removed the QR Code sticker from the watch as he thought it was useless. So when I went over tried to help him set the watch up, we couldn’t proceed to register the watch with the app because the QR Code was missing. So I had to email support to get the ID once more in order for us to register with the app, and it took me about close to a week to get it up and running for them. So this is actually quite a useful feature, as a backup rather that me taking out the sticker and place it at the back side of the cover. A LED light that works as a flashlight. The limitation for the Q50 is that you won’t be able to check back the last message you send from your app. But with this feature, if you noticed the yellow text box actually will display the last text message you sent from your phone app. While the green text box plays the last voice message the watch receives. This indeed is a handy function, so your child won’t keep asking you to repeat your last message if they couldn’t catch it the first time. The long press to talk button is actually for your child to send voice messages back to you. Maximum record length is similar to the Q50 which is 15 seconds. Despite the fact that this watch doesn’t comes with GPS or even a Pedometer, the Q529 GPS watch is indeed a step up as compared to the Q50 watch. Something you might want to reconsider is the design of the watch, as the Phone Button that act as a back and home button pretty much might bring attention to people around them. I would prefer if they just made a round circle or some other icon instead, so that if someone really wanted to kidnap them won’t get them to dismantle the watch. Another feature I wish it had was the Make Friend feature where the watch would be able to pair with another watch, so that they can communicate among each other. 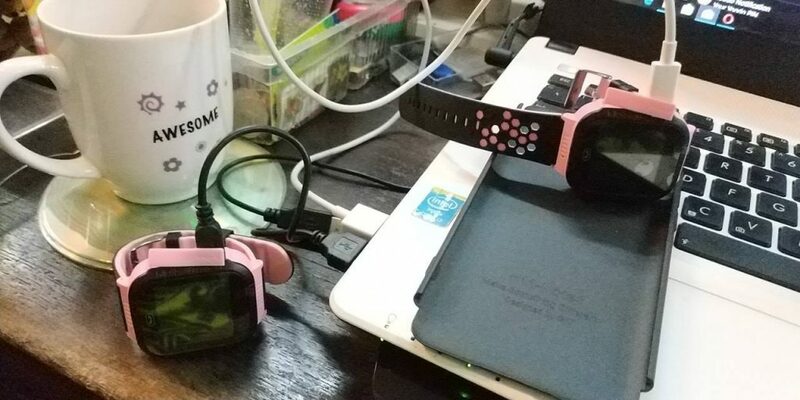 I went and bought another Q50 watch for her best friend, and both of them had a blast voice chatting with each other after I paired both the devices. But unfortunately for the Q50 you can only pair with 1 watch only. I’m still trying to look for the 3G version where it states that it could pair with 10 other watches, so I’ve yet to come across that. Never the less, minus the minor issue I had with this watch. If you want a peace of mind then you should get a GPS watch for your kids. No doubt this would be more easier to use as compared to the Q50, but overall I think it serves its purpose to locate your child and be able to contact your child. If you want to go for something that is less subtle, the Q50 watch is still the best way to go. But if you think you need the other bells and whistles, then this watch will be suitable for you. Anyway, before making any purchases of this watch be sure to check with the seller that it comes with at least the GPS module. Because if it doesn’t, then it will be pointless to have this watch because you won’t be able to track them on their actual location. The priced I paid for both the watches were less than $12, so come to think of it I think they really cut corners by not including those modules inside the watch to be able to sell that low. Always be sure that you check with your seller before making any purchase. Should you have any problems or question feel free to post it here and I’ll get back to you as soon as I can. If you find this post useful, you can support this page by purchasing from either Aliexpress or Gearbest. That would really mean a lot to me. Thanks!